What is the Digital Red software installed on my PC? Digital Red is run by Daniel O’Neill and provides technical support for Windows PCs, laptops, internet connections, phones, tablets, printers etc. 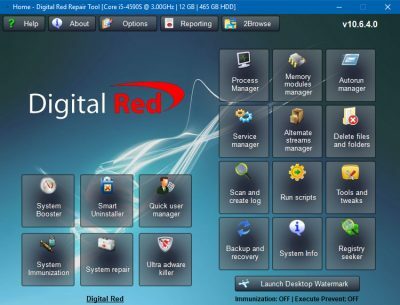 Digital Red doesn’t produce any software and has no programmers, but does brand two different applications which you may have seen installed on your PC. How can I tell if it is installed on my PC? 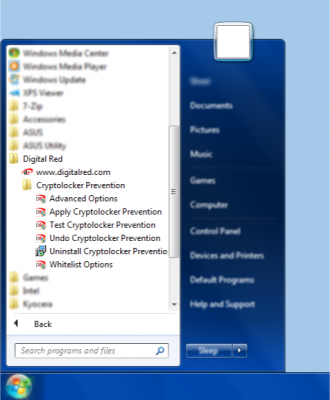 The Cryptolocker Prevention application creates a subfolder in your PC’s Start menu’s list of “All Programs” called “Digital Red” and creates a few shortcuts under the “Cryptolocker Prevention” folder. When installed, the program makes a few changes to your PC to help prevent some kinds of malware infections from harming your PC. There are more details on this page – it’s worth reading if you’re not sure what the program does. Either you chose to install it, or Daniel installed it for you. Nobody else could’ve done it – it doesn’t earn anyone anything by being there. It’s doing you good – you’re better off with it than without it. If you uninstall the Cryptolocker Prevention program, the changes it made on installation are removed and your PC will be vulnerable to the Cryptolocker-type infections again (just as it was before the program was installed – so removing the program doesn’t make your PC worse off than before the program was installed). You can uninstall by going to the usual Control Panel page called “Uninstall a program” or “Add/remove programs” or you can remove it by running the “Uninstall Cryptolocker Prevention” from the Start menu under All Programs -> Digital Red -> Cryptolocker Prevention. You’ll need to reboot your PC after the program has been reinstalled to undo all of its changes. The Cryptolocker Prevention program is developed by a company called Foolish IT and you can read even more about it on their website. The unattended remote support application leaves a small icon in the system tray at the bottom right corner of your screen to show that it is running. If you hover over that icon, you’ll see a bubble appear like the one shown on the right and it’ll say “Digital Red – Computer Name – Idle…” most of the time, and if Daniel is connected, it’ll say “Digital Red – Computer Name – Connected”. If it says Idle and not Connected, no-one is connected to your PC, and only you can see your screen. When installed, the program enables Daniel to log into your PC remotely to be able to see your screen and share control of the mouse and keyboard. There are more details on this page. The program on your PC sends a message to a remote support server which is physically located in Digital Red’s office in Ruislip to show (a) if your PC is online or not, and (b) if your PC is being used or not. Daniel can only connect to a PC if it is online, and will only connect if the PC is not being used unless you have specifically requested otherwise. Either you installed it to let Daniel access your PC, or Daniel installed it for you when setting up a new PC, visiting your office, or perhaps via the other kind of one-time remote support session conducted on the phone after you visited the website. If you uninstall the unattended remote support software, Daniel will be unable to log into your PC. Please bear this in mind if you have an ongoing agreement for Daniel to regularly check your PC for infections, perform backup, or other routine assistance. The program doesn’t do anything else, no-one else can log into your PC but Daniel, and the icon changes to say “Connected” if the remote support session begins. The remote software is based on ScreenConnect which is developed by a company called Elsinore Technologies and you can read more about it on their website. It is a collection of system utilities that help speed up the configuration of new PCs and the repair of old ones. It doesn’t do anything automatically, and doesn’t run in the background doing anything without being opened. It does not give anyone remote access to your PC. The software is based on UVK which is developed by a company called Carifred and you can read more about it on their website.